Some friends invited me to participate in a craft fair next weekend in Brooklyn. At first I started to give my standard “Oh, I don’t really make things to sell, I write knitting patterns so other people can make things” speech, but then I realized that I could print up copies of my patterns and sell them. So, Guess what? I’m gonna do it! I bought some nice lightweight, acid free card stock to print them up on, sheet protectors, ring binders, etc. I’m kind of excited. I’ve only ever sold digital PDFs of my work so it will be pretty cool to be face to face with my customers. I got the cute paper sleeves above for our business cards. 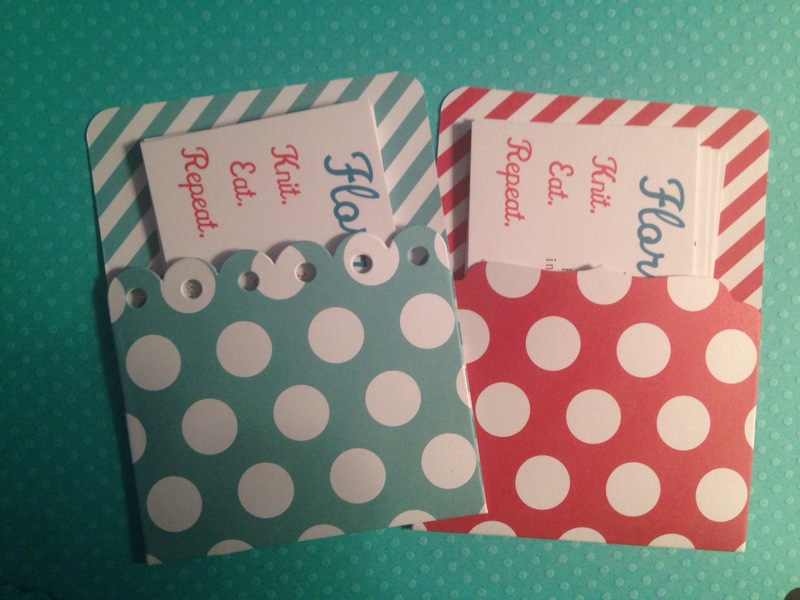 They really meant for scrap booking, but they were so cute and in our FloMa colors, I thought that they would be great little holders for the cards. Its pure accident that the Knit. Eat. Repeat. peeks out perfectly. I’m putting together a few notions to sell, too. I have some vintage sewing supplies and I’m putting together some hand made stitch markers in addition to the knitting patterns. Its shaping up to be fun! Oh gosh, I have to wash and block my samples! If you’ll be in the NYC area, specifically Prospect Park, Brooklyn come say hi! I will be there Sunday 10/13/13 from 11-7. Take the R to 25th Street.